Our Mini Kilte Skirt is our signature piece! The handmade mini Kiltie Skirt in pleated in pure Scottish wool tartan, box pleats are inset with coordinating tartan matching the narrow basque. 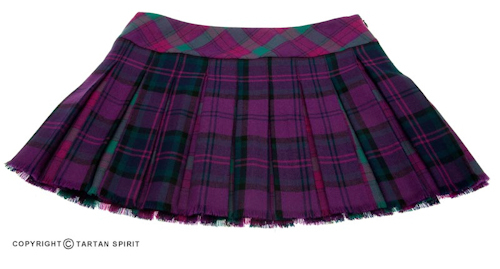 The mini kiltie skirt also features a hand fringed hem and is lined in satin. Inspired by the men’s kilt, Joyce Young wanted to create something fun and desirable for women to wear. We’re proud of our superior quality and design that make up all of our garments. 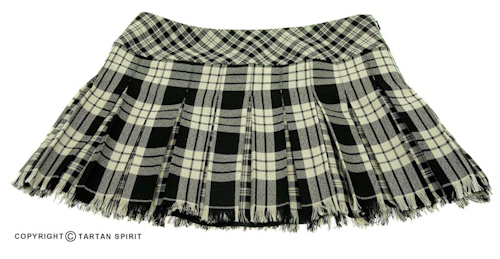 Mini Kiltie Skirts are made at the standard length of 36cm. If you require a longer length, or Made to Measure, please note the price may vary. If you require a sample of fabric for an accurate colour representation, please contact us. If your chosen tartan is not available please contact us to arrange your Kiltie Skirt in your desired tartan.